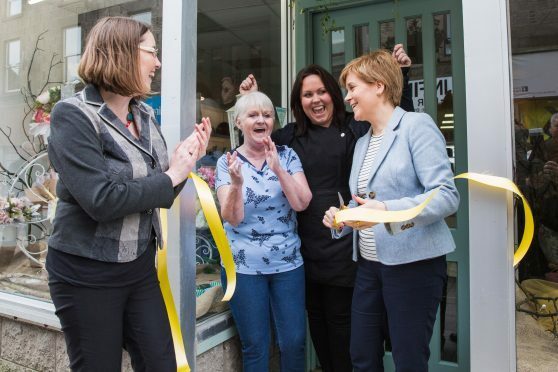 Eilidh Whiteford and Nicola Sturgeon help mother and daughter pair Kathleen Schuitema and Lindsay Palmer open their shop. North-east election candidate Eilidh Whiteford has revealed hundreds of local people have backed her campaign to save Peterhead power station. Last month, the SNP incumbent in Banff and Buchan launched a petition to protect the gas-powered facility which had its future thrown into doubt by a decision to scrap an ambitious carbon capture and storage (CCS) scheme. Work had already been carried out by oil giant Shell and SSE when the Conservative government axed £1billion of funding for CCS in 2015. Now, hundreds of people have joined the campaign which is also backed in the SNP’s manifesto and calls for the CCS plans to be revived. Ms Whiteford said: “The SNP has a strong record of standing up for the energy sector in Scotland and it is clear local people support protecting the power station from closure. “Hundreds of people have made it clear in only a few weeks that they believe like we do, that the site has a future. She also claimed that the Tory move to ditch CCS has thrown around 90 jobs into jeopardy at the plant. Contesting the Banff and Buchan against incumbent Ms Whiteford are Liberal Democrat Galen Milne, Conservative David Duguid and Labour’s Caitlin Stott.